This monochrome laser printer is aimed at busy offices with the most demanding jobs. Unlike its predecessor, the Epson AcuLaser M4000DN mono workgroup printer has a built-in duplexer but it continues to ensure fast print speeds and a reliable performance. The AcuLaser M4000DN A4 monochrome laser printer for medium and large workgroups is network-ready, too, but it is expensive and noisy. This large and boxy unit may take up space on a typical desktop because it measures 480mm long and 428mm wide. The Epson M4000DN workgroup printer weighs 21.5Kg with the matte but resilient plastic frame, 1200dpi laser print engine, 550-sheet input tray, the duplex unit, 150-sheet multi-purpose tray, and the toner cartridge. The connectivity options of the Epson AcuLaser M4000DN printer include parallel, Ethernet, and high-speed USB 2.0, but it can accommodate an optional Type B interface, too. The M-4000DN printer model runs on 64MB of memory with a 500MHz processor. A generous duty cycle and fast print speeds of up to 43ppm are among the top qualities of the Epson AcuLaser M4000DN mono laser printer. It comes with a duplexer. The print quality and speed are able to keep up when two-sided printing is being used. 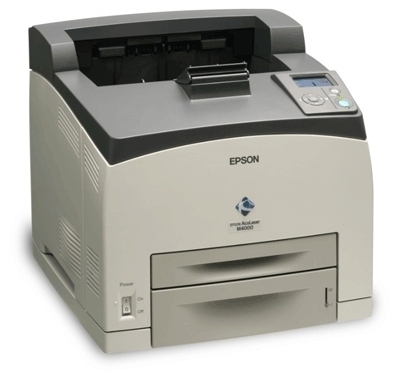 The Epson AcuLaser M4000DN laser printer can be expanded for higher memory and paper capacity. Users may integrate a HDD into the device for security and document storage. The device is also praised for its versatile connectivity and good quality output. High-yield Epson AcuLaser M4000DN toners are used by the printer in order to handle heavy workloads with maximum cost-efficiency. The AcuLaser M4000DN monochrome printer may be fast but that means more noise is emitted while operating. It is also an expensive printer when compared to similar but more affordable options offered by the competition. The Epson M4000DN AcuLaser could be better with a larger display screen that can be tilted or flipped-up.